Tedric Thompson, Nick Vannett among players who will have to step into key roles Sunday against the Rams. Here’s a look at the Seahawks’ NFC West showdown Sunday with the Rams at CenturyLink Field. Kickoff is 1:25 p.m. Simply put, this is a game Seattle has to win to keep any realistic hope alive of staying in the division race in the NFC West. A loss and Seattle will be three out already, a tough hill to climb in the best of circumstances, let alone with what appear to be the differing trajectories of the two teams. For Seattle, it’s also a chance to avenge a 42-7 loss to the Rams last December that was the largest of the Pete Carroll era. For the Rams, it’s a chance to show that win was truly a sign that the power has shifted in the NFC West. Rams QB Jared Goff vs. Seattle defense. The third-year QB out of Cal is an early favorite, along with Patrick Mahomes, for NFL MVP honors, coming off the best game anyone can possibly have — a five-TD performance that resulted in a perfect 158.3 passer rating against the Vikings — averaging a whopping 10.49 yards per attempt. Now he faces a Seattle defense that for the first time since the 2009 season will play a game without at least one of the founding members of the Legion of Boom in its secondary. Seattle’s back seven will include three players with three or fewer career starts — right cornerback Tre Flowers (three), weakside linebacker Austin Calitro (one) and free safety Tedric Thompson (making his first career start). That will put the onus on the line to play its best game and put some pressure on Goff, something Seattle hasn’t done as consistently well as it would like, especially out of its base defense. The Rams are known for their willingness to throw on early downs, which might compel the Seahawks to use their nickel and dime defenses more often. Thompson steps into the biggest shoes possible, taking over the role Thomas held for all but seven previous games of the Pete Carroll era as the last line of defense and does so against a team on pace to set an NFL record for yards in a season. So welcome to the big time, kid. The Seahawks have professed a lot of confidence in Thompson, and his college pedigree and what was basically a redshirt season last year give ample reason to think it’s not misplaced. But even Thomas needed some time to really find himself in Carroll’s defense. What isn’t a question is that the Rams will do everything they can to find Thompson and try to exploit his inexperience. Will the Seahawks bust open the playbook? Much has been made of Seattle’s run-pass ratio in a season when most teams are passing more than ever. 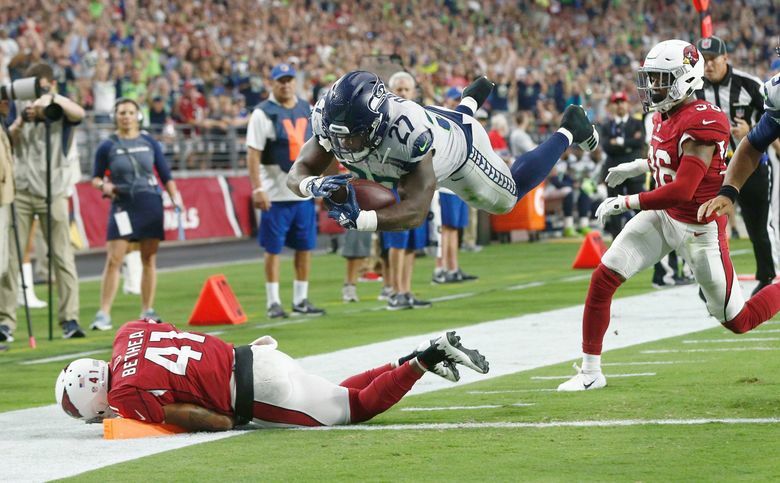 Seattle has thrown it just 50.78 percent of the time the past three weeks, the third fewest in the NFL in that span, and 55.24 percent for the season, seventh fewest (interestingly, the Rams are just ahead of the Seahawks in throwing it only 55.12 percent of the time — but that’s been in part due to running out the clock on some big leads). This question could be viewed two ways — 1, that maybe the Seahawks need to keep running it as much as they can to try to limit the possessions it gives to an explosive Rams team, something that’s been a core Carroll tenet for years anyway; 2, that they know they’ll need to score a lot of points to beat the Rams so they may as well throw caution to the wind from the start. This feels like a good game to try to take some shots. Special teams seem to never be a bigger deal than when the Rams play the Seahawks — recall how last year’s game in Seattle turned on a big early punt return for Los Angeles that set up a 1-yard TD that made it 13-0. The Rams also seem to always have something, well, special planned in its special teams for the Seahawks (John Fassel has been their special-teams coach since 2012, staying on in the transition to Sean McVay a year ago). Seahawks punter Michael Dickson has been great so far. Seattle is fifth in the NFL in net punting at 44.9. One of the few who has been better is Rams punter Johnny Hekker, a Bothell High grad who rates fourth at 45.5 (albeit on just seven attempts compared to Dickson’s 25). Vannett will take on a larger role the next two weeks with Will Dissly sidelined for the year and Ed Dickson unable to come off the non-football injury list until the Detroit game Oct. 28. As was revealed during the week, the Seahawks plan to use backup tackle George Fant as an in-line tight end to allow Vannett to play his usual off-line role in two-tight end formations. But Vannett figures to be the tight end in most of the one-tight end formations and his run blocking — by all accounts, vastly improved this year — and making the most of his targets will be critical. The first number is the average number of yards the Rams gain per play and the second is the average the Seahawks gain. Yep, the Rams gain 2.5 yards more per attempt than Seattle with a total that is on pace to shatter the NFL record. The New Orleans team that set the NFL record for most yards gained in a season in 2011 averaged 6.7 yards per play. The 2013 Denver team that scored the most points in NFL history before being blasted by Seattle in the Super Bowl averaged 6.33 yards per play. Suffice to say, the Rams are first in the NFL. Seattle, meanwhile, is 30th with an average that is on pace to be the lowest of the Russell Wilson era. The Seahawks averaged 5.2 last season. The two defenses, at least, are similar: Seattle is allowing 5.2 and the Rams 5.8. Seattle’s always had problems with the Rams during the Wilson era even in the best of times. These are hardly those, as the Rams look like one of the two best teams in the NFL while Seattle appears a middle-of-the-road club that now has to venture through the rest of the season without one of its two best defensive players. Seattle couldn’t have picked a worse matchup to begin the post-Earl Thomas era.